French Orientalist; born at Hamburg, Germany, July 9, 1825; died in Paris, Aug. 19, 1905. He was educated at the "Johanneum" in his native city, and in 1844 studied law at Heidelberg. Becoming interested in Oriental studies, he left Heidelberg for Bonn, and later studied at Berlin and at Kiel (Ph. D. 1847). The title of his dissertation was "De Jure Indorum Criminali." Leaving Germany, Oppert went to France in the same year in which he received his degree. There he was welcomed by such scholars as Letronne, Burnouf, De Saulcy, and Longpérier, whose attention had been attracted by his "Lautsystem des Altpersischen" (Berlin, 1847). This work was a preliminary to one of the most important contributions on Old Persian, his "Mémoire sur les Inscriptions Achémenides Conçues dans l'Idiome des Anciens Perses" (in "Journal Asiatique," 4th series, vols. xvii.-xix., Paris, 1851-52; also published separately in the latter year). In 1848 Oppert was appointed professor of German in the lyeée at Laval, whence he was called in 1850 to Reims. In 1851, with Fulgence Fresnel as director and Felix Thomas as architect, Oppert went as the Assyriologist of an expedition sent by the French government to explore Media and Mesopotamia. Here he first definitely identified the site of ancient Babylon. In 1854 Oppert returned with the party, excepting Thomas, who had died, and published the results of the mission in his "Expédition Scientifique en Mésopotamic" (2 vols., ib. 1857-64). This received the prize, then awarded for the second time, of 20,000 francs offered for the work or discovery best fitted to honor or benefit France. The year of his return he was naturalized as a French citizen for his services. In 1855 Oppert was sent to England by the minister of public instruction to examine the Assyrian collections in the British Museum. On his return to France in the following year he received the cross of the Legion of Honor, of which he became an officer in 1885. 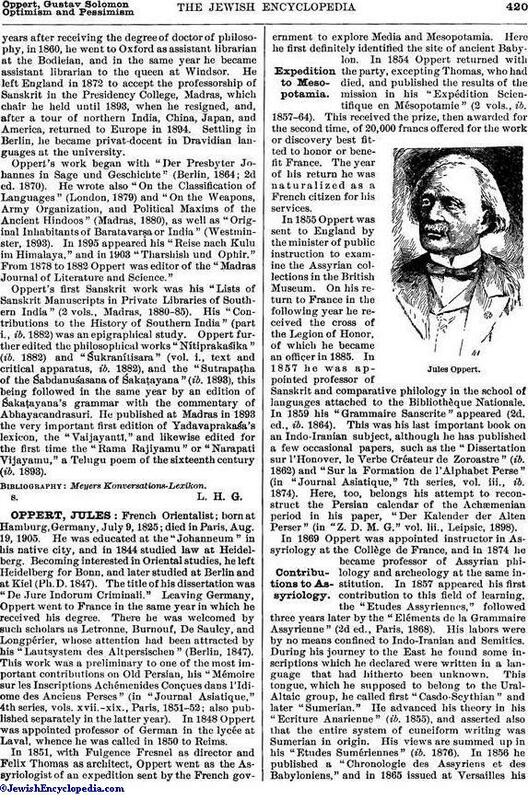 In 1857 he was appointed professor of Sanskrit and comparative philology in the school of languages attached to the Bibliothèque Nationale. In 1859 his "Grammaire Sanscrite" appeared (2d. ed., ib. 1864). This was his last important book on an Indo-Iranian subject, although he has published a few occasional papers, such as the "Dissertation sur l'Honover, le Verbe Créateur de Zoroastre" (ib. 1862) and "Sur la Formation de l'Alphabet Perse" (in "Journal Asiatique," 7th series, vol. iii., ib. 1874). Here, too, belongs his attempt to reconstruct the Persian calendar of the Achæmenian period in his paper, "Der Kalender der Alten Perser" (in "Z. D. M. G." vol. lii., Leipsic, 1898). In 1869 Oppert was appointed instructor in Assyriology at the Collège de France, and in 1874 he became professor of Assyrian philology and archeology at the same institution. In 1857 appeared his first contribution to this field of learning, the "Etudes Assyriennes," followed three years later by the "Eléments de la Grammaire Assyrienne" (2d ed., Paris, 1868). His labors were by no means confined to Indo-Iranian and Semitics. During his journey to the East he found some inscriptions which he declared were written in a language that had hitherto been unknown. This tongue, which he supposed to belong to the Ural-Altaic group, he called first "Casdo-Scythian" and later "Sumerian." He advanced his theory in his "Ecriture Anarienne" (ib. 1855), and asserted also that the entire system of cuneiform writing was Sumerian in origin. His views are summed up in his "Etudes Sumériennes" (ib. 1876). In 1856 he published a "Chronologie des Assyriens et des Babyloniens," and in 1865 issued at Versailles his"Histoire des Empires de Chaldée et d'Assyrie," extending from the settlement of the Semites in Mesopotamia, about 2000 B.C., to the Seleucid period, about 150 B.C. In Assyriology Oppert devoted himself during this period to historical, juristic, and mythological inscriptions. Although he published many articles on these texts, his only books are the "Fastes de Sargon, Roi d'Assyrie" (2 vols., ib. 1863), "Les Inscriptions de Dour-Sarkayan" (ib. 1870), and "Documents Juridiques de l'Assyrie et de la Chaldée" (ib. 1877), the last prepared in collaboration with Joachim Menant. Not only was Oppert the first to study these texts, but he led the way in the interpretation of the Babylonian contract-tablets, and was also the pioneer in the investigation of the astronomical and astrological inscriptions. He likewise discussed Assyrian measures in his "Etalon des Mésures Assyriennes" (ib. 1875). 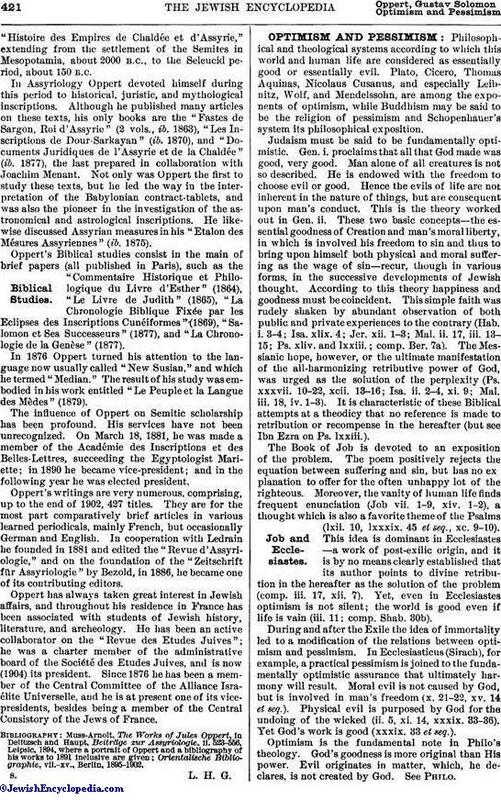 Oppert's Biblical studies consist in the main of brief papers (all published in Paris), such as the "Commentaire Historique et Philologique du Livre d'Esther" (1864), "Le Livre de Judith" (1865), "La Chronologie, Biblique Fixée par les Eclipses des Inscriptions Cunéiformes" (1869), "Salomon et Ses Successeurs" (1877), and "La Chronologie de la Genèse" (1877). In 1876 Oppert turned his attention to the language now usually called "New Susian," and which he termed "Median." The result of his study was embodied in his work entitled "Le Peuple et la Langue des Mèdes" (1879). The influence of Oppert on Semitic scholarship has been profound. His services have not been unrecognized. On March 18, 1881, he was made a member of the Académie des Inscriptions et des Belles-Lettres, succeeding the Egyptologist Mariette; in 1890 he became vice-president; and in the following year he was elected president. Oppert's writings are very numerous, comprising, up to the end of 1902, 427 titles. They are for the most part comparatively brief articles in various learned periodicals, mainly French, but occasionally German and English. In cooperation with Ledrain he founded in 1881 and edited the "Revue d'Assyriologie," and on the foundation of the "Zeitschrift für Assyriologie" by Bezold, in 1886, he became one of its contributing editors. Oppert has always taken great interest in Jewish affairs, and throughout his residence in France has been associated with students of Jewish history, literature, and archeology. He has been an active collaborator on the "Revue des Etudes Juives"; he was a charter member of the administrative board of the Société des Etudes Juives, and is now (1904) its president. Since 1876 he has been a member of the Central Committee of the Alliance Israélite Universelle, and he is at present one of its vice-presidents, besides being a member of the Central Consistory of the Jews of France. Orientalische Bibliographie, vii.-xv., Berlin, 1895-1902.